heat up kitchen appliance to 350 degrees F (175 degrees C). Grease a thirteen x nine in. baking dish and canopy very cheap with a skinny layer of bread crumbs. soften butter during a little cooking pan over low heat and cook garlic till tender, regarding five minutes. during a shallow bowl, combine along bread crumbs, cheese cheese, store cheese, parsley, oregano, pepper, and salt. Dip every malformation in spread to coat, then press into the bread crumb mixture. 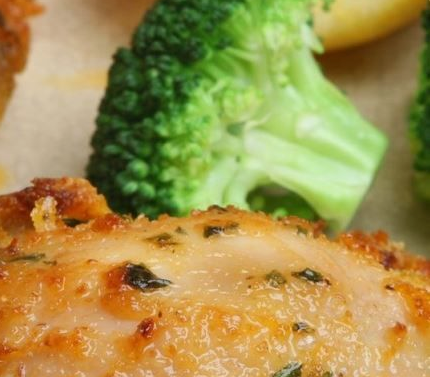 Place coated chicken breasts during a ready baking dish. Drizzle with any remaining butter and sprinkle with any remaining bread crumb mixture. Bake for half-hour or till chicken is not any longer pink and juices run clear. 0 Response to "Baked Garlic Cheddar Chicken"